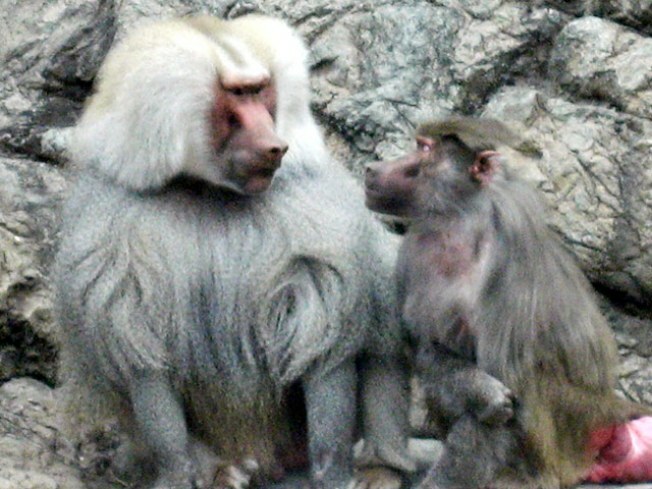 Hamadryas baboons ready for lurve at the Prospect Park Zoo. BIRDS DO IT, BEES DO IT: It’s chicka-chicka-bow-wow time at the ProspectPark Zoo, with a full V-Day program of edutainment about animal, ah, husbandry. At "Dating and Mating," learn about critter aphrodisiacs, the reproductive strategies of various species and (sez the press release) “why size really does matter.” Three words: Live animal demo. Sunday, 2-3:30PM (advance registration required at ppzeducation@ wcs.org or 718-399-7339 x326). SWEET HEART: Love means never having to say you’re sorry… dragging your darling of bed early on a freezing Sunday morning to go on a Valentine’s Day chocolate walk of downtown. (Yes, in our book, 11AM is early for a Sunday.) Follow Walking Tours Manhattan to chocolate makers like MarieBelle and Vosges, and taste your way to a few extra, wonderful pounds. Bonus: A $5 donation goes to the Food Bank for New York City. Sunday, 11AM. GRANDE DAME: Crank the Camp-o-Meter to 100, kids: Florence Henderson, a.k.a. Carol Brady, is one of the hardest-working dames in show business -- she’s been singing and acting for more than 50 years, and she’ll pack every one of them into her special Valentine’s weekend concert, “All of Me,” at Joe’s Pub. Expect songs (from her many Broadway forays, such as “Oklahoma”), gossip (love!) and material written by none other than professional banter scribe Bruce Vilanch. Friday and Saturday, 7PM.